Fat is a term used to describe a class of macro nutrients used in metabolism called triglycerides. These make up one of three classes of macronutrients including proteins and carbohydrates. Fats provide a means of storing energy for most eukaryotes, as well as act as a food source. Fats have the highest energy storage potential of the macronutrients, and are very chemically stable, making them ideal for storing energy for later use. Macronutrients does not refer to the size of the molecule, but to the amount needed to sustain life. Vitamins and minerals are considered micronutrients. Triglycerides consist of a glycerol backbone bonded to three fatty acid chains via an ester bond. The ester bond allows for easy breaking via hydrophilic attack by water, rendering the fatty acid chains suitable for breakdown in regular metabolism. Fatty acid chains are built by endogenous enzymatic machinery by linking malonyl-coenzyme-A units together. The chain is elongated on a single fatty-acid synthase until it reaches a length determined by the biochemistry of its producer. At the point of termination, the fatty acid is hydrolyzed off the synthase forming the carboxylic acid derivative. This produces a fatty acid of even carbon length. Most fatty acids are formed this way and therefore most fatty acids have an even number of carbons. Triglycerides are formed by a phosphorylated glycerol molecule being nucleophilically attacked by a fatty acid-coenzyme A. This causes an esterification reaction that produces an ester bond between the carboxyl group of the fatty acid and one of the three hydroxyl groups of the glycerol. Synthases that catalyze these reactions are sterically specific to incorporate one type of fatty acid. They only produce one type of triglyceride. Fat is organized into two subgroups: saturated fat, and unsaturated fat. Unsaturated fat is further classified as monounsaturated fat, polyunsaturated fat, and trans-fat. These different classifications determine the effects of these fats on an organism, and the roles that they have in metabolism. Saturated fat, or animal fat, is composed of a glycerol backbone with three fully saturated fatty acids attached. 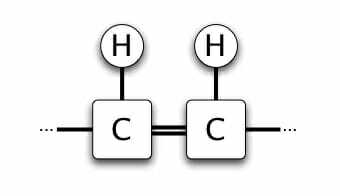 Saturated refers to all the carbons in the backbone being sp3 hybridized, with two hydrogen atoms covalently bonded per carbon. This class of fats have higher viscosity and energy content than their unsaturated cousins. Due to poor solubility issues, this is the type of fat that is most commonly associated with heart disease. 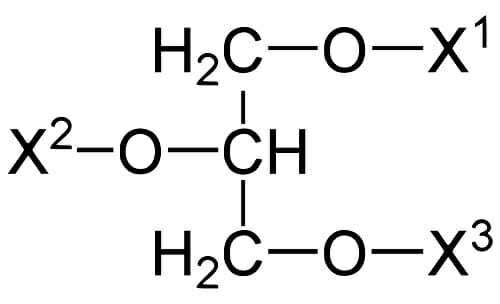 Unsaturated fat, or vegetable fat, is composed of a glycerol backbone with three fatty acid chains where there is at least one sp2 hybridized carbon. 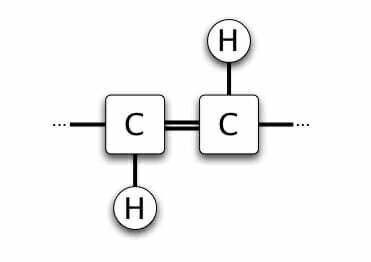 This forms a double bond somewhere in the chain. Monounsaturated fats have one double bond in the chain, while polyunsaturated fats have two or more. Naturally occurring unsaturated fats, since they are produced by enzymes, have specific stereochemistry. Natural fats always show the cis conformation, which has a higher solubility in water, and is easily broken down by the metabolic machinery. Artificially produced fats, since they are produced using organic synthesis techniques, contain a racemic mixture of trans and cis bonds. Trans fats are less soluble – like saturated fats. However, they are not readily metabolized by cellular machinery. The unsaturated fats are classified by the position of the unsaturation. This designation is denoted by the ω symbol, then the number of carbon with the unsaturation. For example, ω-3 fats have an unsaturation at the third carbon position. Ω-3,7 polyunsaturated fats have an unsaturation at the third and seventh carbon position. The position of the unsaturation determines the metabolic pathway that the fat will follow. Examples of saturated fat include animal fat found on beef, pork, and chicken. Since these types of fats are also called “animal fats”, they are primarily found in animals. Saturated fat measurements are used in medical diagnostic tests as inverse indicators of a healthy lifestyle. Monounsaturated fats are often referred to as “good” fats. They make up the oils and fats found in avocados and olive oil. Polyunsaturated fats are found in canola oil and other less viscous plant oils. Trans fats are chemically produced fats. They are generally considered to be unhealthy, and are found in mass produced oil found in processed and fried foods. Trans fats have a controversial history. They have even been banned for consumer use in some countries. 1. Which is NOT a type of fat? D is correct. Polyunsaturated, monounsaturated, and saturated are all examples of fats. Fat carbons cannot be supersaturated. 2. Which Greek letter is used to denote unsaturations in biological nomenclature? C is correct. The letter ω is used to denote the position of the unsaturation or unsaturations in a triglyceride. There may be one or several numbers indicating the carbon position of the unsaturation. 3. Which is NOT one of the three types of macronutrients? B is correct. The three types of macronutrients are fat, protein and carbohydrates. Vitamins are considered micronutrients.